Is Harrison Ford starring in the Blade Runner sequel? With Ridley Scott giving us a Ripley-free Alien movie, it wouldn't be surprising if his new Blade Runner project didn't include Harrison Ford's replicant hunter Deckard. 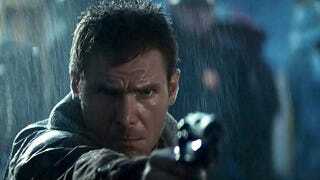 But Harrison Ford may be picking up the blaster for a direct Blade Runner sequel. Twitch is reporting that Ford is in talks to appear in the Scott-helmed film. This contradicts an earlier statement by Alcon Entertainment producer Andrew Kosove, who said the movie was envisioned as an entirely new, Ford-less take on the Blade Runner universe (although he said he couldn't speak for Scott). If Ford does appear in the next Blade Runner film, will it be a direct sequel to the original? Will he play an older, decidedly human Deckard? Or could he be playing an aged-up replicant? (Or will he visit the CG fountain of youth, like Jeff Bridges did in Tron Legacy?) And would the new movie utterly destroy the ambiguity of the original?